The character of the parcel of land in the Aravalli-Raisina Hill region selected for building New Delhi was almost dramatically transformed by Edwin Lutyens from its original rocky, semi-arid landscape to that of a pleasant garden city consisting of a low rise—low density habitat set amidst evergreen tree lined avenues, large open spaces and an expansive green lawn with shallow water bodies in the middle of the new capital city. From being the capital of a nation of 279 million souls in 1931, New Delhi presently serves as the capital city of the most populous democracy of the world having a population of over 1.2 billion. 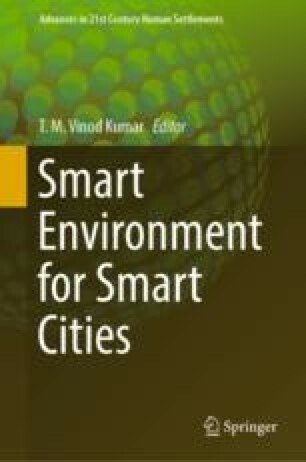 The idea of transforming New Delhi under the Smart City Mission of the Government of India launched in 2015 was possibly aimed at achieving two goals: (i) to be counted among the renowned smart capital cities of the world and (ii) to ensure ushering in of a new lease of life for New Delhi, far into the 21st century. Significantly increased dependence on solar energy, software driven management of city services and generally improved efficiency of traffic flows, security and other aspects of citizens’ daily life represent the perceived dimensions of smart New Delhi. Visualizing the environmental cost of such transformation is the concern of this chapter. In the process it is discovered, that many of the implemented and ongoing improvements are also in the list of Smart City project of New Delhi. Several of them have been already attempted as the city confronted a variety of challenges from time to time. The aspect of environmental impact resulting from addressing the challenges such as erecting the he LIC building at the periphery of Connaught Place (Rajeev Chowk), DMRC node in the central park of Connaught Place (Rajeev Chowk) and redensifying the single storeyed residential neighbourhoods by four storeyed apartments were hardly visualized and much less addressed. After a close review of the New Delhi Smart City Plan, against a multitude crucial parameters like population density, landuse, traffic, water, sanitation, power and waste management, the present chapter conducts an impact analysis and proposes a comprehensive environmental management plan. The authors would like to acknowledge Indian Society for Applied Research & Development (ISARD), supported by Kyoto University, Kyushu University, Asia-Pacific Network for Global Climate Change Research (APN) for conducting Expert Workshop on Low Emission Development Strategies in Delhi on May 21, 2018 that was crucial in deliberating issues with the concerned stakeholders for New Delhi to become a smart city. Thanks is also due to Aesha Upadhyay and Prachi Gupta, both masters students of Dr. APJ Abdul Kalam Technical University, India for formatting the draft chapter, painstakingly compiling citations and list of references.